For those that have dreamed about a log home or timber frame home for years, you probably have a definite vision of what it will look like. How does the image in your mind transform into the physical home of your dreams? How do you know if your architect understands your vision? The challenge for your architect is to not only create a design based on your vision, but to also give you the confidence you need to move forward with your project. This is why we offer you a virtual reality tour of your home. 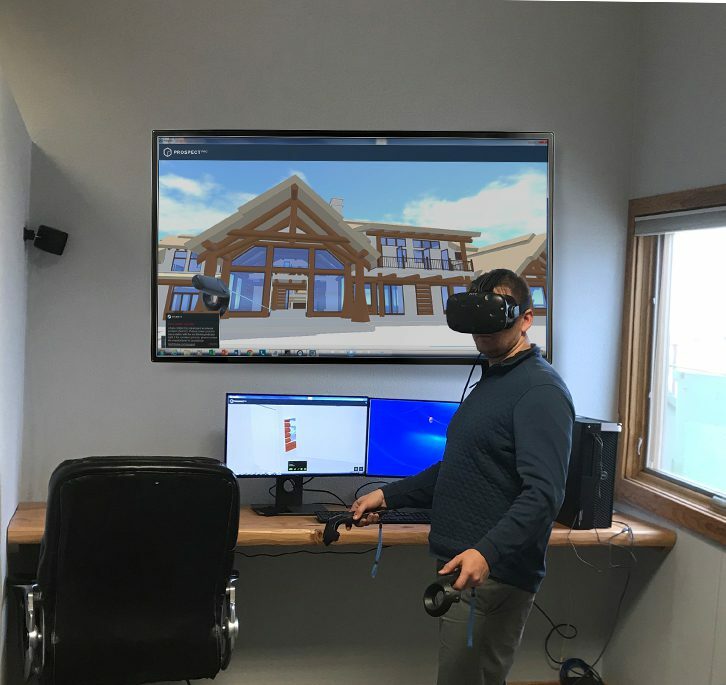 At M.T.N Design, the in-house design firm of PrecisionCraft Log & Timber Homes, our degreed architects use floor plans, renderings, and virtual reality tours to share your home’s design with you. 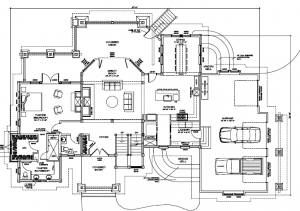 The floor plan and rendering allow you to see your custom home design on paper. Then, the virtual reality tour allows you to experience your home as if it were already built. Used in combination, these three elements immerse you in your home’s design and give you the opportunity to make design changes before you build your home. Exterior renderings provide you with a full-color view of your home’s exterior. Renderings are either hand drawn or created with computer software. While a hand sketch can be artistic, it may not show the same level of detail as computer-generated rendering. There is an art to creating renderings. Depending on the skill of your designer, quality may range from a photo realistic depiction to one that looks like a cartoon. Some architects even have the ability to place your home in a photo of your property, making the final picture of what your custom home will look like more clear. A key feature of your completed mountain style home is how it blends into the surrounding landscape. Therefore, the degreed architects at M.T.N Design use actual pictures of your land in the rendering. This brings to life what your home will look like on your property. It is also very useful in the design process. If your property is sloped or wooded, this technique helps your designer and you better understand the lay of your land and how your home fits into it. In 2018, M.T.N Design began using virtual reality (VR) tours in their design presentation. The VR tour gives you the opportunity to walk around your home before it is built. Once inside, you are immersed in your new home as if you were standing in it. With VR, you can see the log and timber trusses and details found in your home’s interior. You can feel the volume of space in your two-story great room. A VR tour also allows you to better understand how the rooms and spaces flow into one another. After years of researching, planning, and designing, your architect understands how excited you are to get your dream home started. By utilizing these rendering technologies and a virtual reality tour, your designer can offer you an accurate and detailed view into what your future home will look like. This should give you ample confidence to move forward with your project. Learn more about the design process at M.T.N Design, or view PrecisionCraft’s floor plan gallery and photo gallery. Ready to start your home design, or have a questions? Contact us today.